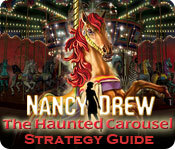 Free Nancy Drew: The Haunted Carousel Strategy Guide download for PC - Full Demo or Buy it now at PopGamers.com! Play as Nancy Drew and explore a seaside amusement park at Jersey Shore. Use the Official Strategy Guide to solve the mystery behind a rider-less carousel that runs by night, and other strange occurrences. You must question everyone to catch a cunning criminal. The Nancy Drew Strategy Guide is written in a special format to keep the ending a secret. Complete the game to uncover the culprit or culprits behind the Haunted Carousel.